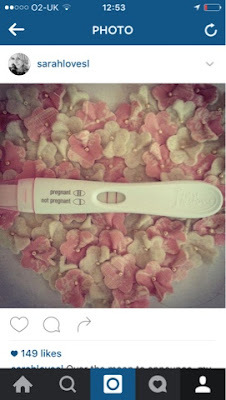 When you announce a pregnancy, in the vast majority of cases, the reaction is one of great happiness, with lots of phone calls, hugs, congratulations, hundreds of social media 'likes', and general excitement - ours was definitely no different. However, after a while, we noticed a few comments which surprised us a little, albeit from people we weren't especially close to - work colleagues we didn't see often, relatives that don't live nearby etc. We can't post anything jokey on Facebook about being up early/wanting to go on holiday/going out for a meal etc without comments like this! Wow, way to buzz kill, people! Whilst Sarah doesn't suffer fools and did reply mentioning that 1. How many 20yr old boys are up early?! 2. After the age of about 10, why would we need to get up early with them?! And thirdly, a half joking (OK, entirely passive aggressive :p) comment along the lines of "we paid thousands and went through years of treatment to get our much dreamt of baby, but early mornings?! If only the IVF clinic had told us, we'd have reconsidered!" Ever since we did a road trip through California for our 1st wedding anniversary (18 months before our pregnancy announcement) we've had comments joking that it would be our last holiday that didn't involve a caravan park with a kids club, or Peppa Pig World. Since then we've been to Malta and St Lucia, and got similar comments. Don't get us wrong, we know our holidays will involve less sunbathing and champagne. That's hardly important in the grand scheme of things! But travel is something we love - a love we want to pass on to our child. We already have a few plans of future holidays we want to take with our son. They include California, Iceland, and Hawaii. Also, further into to the future, when we are mid 40s, our teenage son most likely won't want to join us on holiday! There are also grandparents (two of which live in Malta part of the year) to babysit. Both options leave plenty of sunbathing and champagne options. All this aside, do they not think less/different holidays is a chance most people would jump at taking if it meant they got to be parents?! We hear a lot that 'people without children don't know what tiredness is'. Lauren works 12hr shifts often with no break in busy hospital departments, and has worked 72 hour weeks. She has got up at 4am to drive two hours to a job, work 12hrs, and drive 2hrs back. Whilst pregnant and suffering from sickness and SPD. Thankfully we have friends who are fellow NHS workers who've said actually, they find hospital work more tiring, and another friend who is a single parent that joked "so what if you're up all night? You're on maternity leave, what are you going to do all day tomorrow apart from watch Jeremy Kyle?!" We aren't naive. We know having children is one of the hardest things people do. We also know its the most rewarding, and something we have longed for for a very long time. We chose our sons name around 8 years ago! Also - newsflash, this wasn't an accidental pregnancy - this took a lot of money, counselling appointments, blood tests, invasive scans, weeks of daily injections, medication, operations, medical procedures, dashed hopes, and months of anxiety. It's kind of ridiculous for someone to say, after all that, "I hope you know you'll go for meals less!" 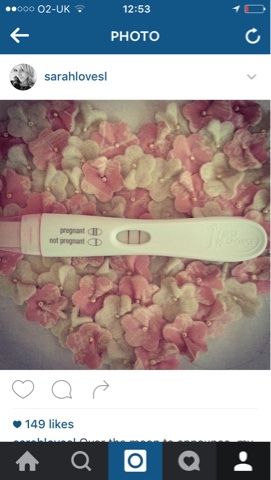 It's weird how people seem to lose their filter for inappropriate comments when you're pregnant. "So which one of you is his mum? I mean his real mum"
"do you ever look at guys in the street and wonder if they could be your baby's dad?" "Who will be his male role model as his dad (again, they meant donor) won't be in his life?" "So really it's like one of you adopted the baby?" As well as lots of questions about what people eat (we've had numerous people ask if Lauren will stop being vegetarian - nope! ), how much they eat, how much weight they've gained, how they will parent, and in general, ridiculously nosey questions, and pretty rude assumptions! A couple of people, have been genuinely curious about how our baby was made, which we completely understand. If you're heterosexual, then making a baby with no man involved might be something of a mystery! So we've had a few people ask in private "If you don't mind me asking, I know its personal/private etc" if we'd mind explaining it to them. Which of course we don't. However, not everyone is as considerate. 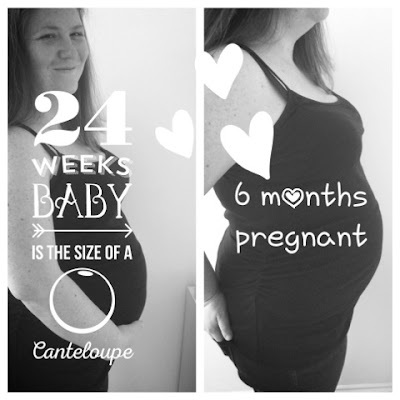 We recently saw a relative we rarely see, whilst at a dinner table in a restaurant with a large gathering of our family, for the first time since we announced our pregnancy. Although they sent us a card when we shared our news, Their first comment in person was 'SO! We had three questions - how did you pick your donor? Do you know him? Is it like sperm donor Argos catalogue? Haha!" (People always ask about the sperm donor - it's like a fascination for them). We found this a little inappropriate given the occasion, and kind of rude! They also asked if we had embryos frozen for future use (yes, we are lucky to have one), and luckily, they couldn't remember the third question! We imagined it was something like if we'd ever use Sarah's eggs or if she'd carry, questions which she would swiftly make them regret asking with in depth explanations of her infertility! "Get your sleep in now!" Why, can you store sleep?! So, ramble over! As we said, although nothing would be enough to have a negative effect on something so wonderful, and so long in the making, we definitely found some peoples comments a little odd! But these comments have been few and far between when compared to lovely, happy ones. People constantly ask how many weeks to go (just 14!) how big the baby is now (a lettuce! ), and when we will decorate his nursery (umm, not yet!). We are constantly given gifts (we'll never need to buy a baby blanket, ever!) , people tell Lauren she is glowing, and on a recent trip to London, on three occasions people voluntarily offered their seat to Lauren on the tube. People are lovely. 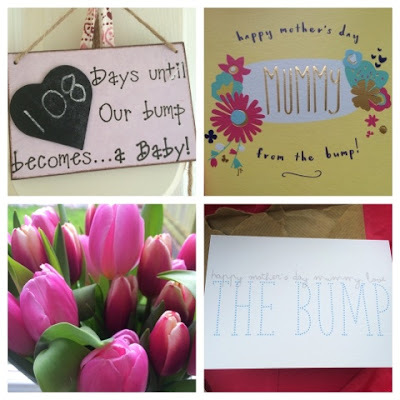 On 2nd March we got another lovely milestone when Sarah felt our baby kick for the first time! It's so wonderful to both lie in bed feeling our little one kicking away together. 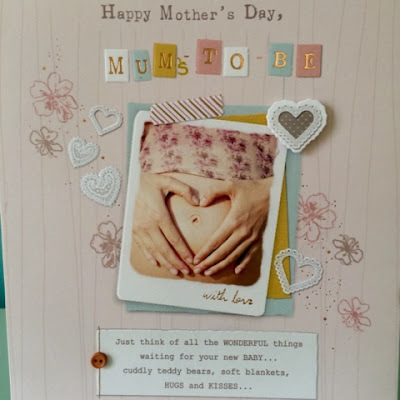 We got each other 'from the bump' Mother's Day cards, and were surprised with a card from Sarah's Mom too. Very strange and very wonderful to think that next Mothers Day we will have a nine month old son! Time is flying by. 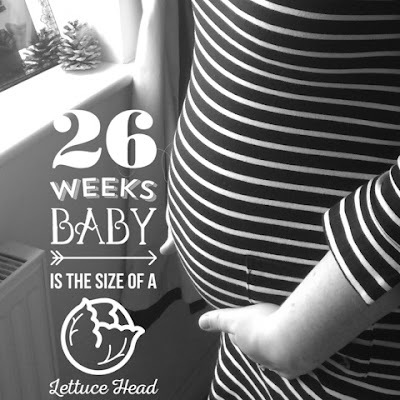 Today we are 26 weeks. Six and a half months pregnant. Our baby's eyes are forming - they will soon start to open, and his eyelashes are now grown too. Our baby is getting his immune system ready for life on the outside by soaking up antibodies, and he's taking breaths, too. (They're of amniotic fluid, not air). He can detect light and dark, and is beginning to hear outside sounds - so Sarah is constantly telling him how much we love him! We are now in double figures - 98 days until our due date - we are so excited to meet you, baby boy. We're not completely 'out' yet as we're still only 10 weeks, but I am starting to see it already, one friend who has an (adopted) son: "Everyone will want to give you advice and it will make your head spin, don't listen, trust your instincts." [ten minutes later] "If there is one piece of advice I could give you, it would be [proceed to talk about sleep training]" we just smiled and nodded!